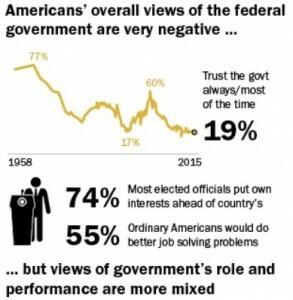 According to the latest Pew Research poll the United States media is less trusted than media in any other country including Russia, Mexico, Ghana and Nigeria. Maybe even Haiti. The MSM in the U.S. has continued to be nothing more than the LEFT’s bias agenda for years; however, with the election of President Donald Trump, they have truly jumped the shark. The MSM does not care whether there are supportive facts or not in promoting their hate-Trump stories. Who cares whether the sources are credible? As long as the story-line fits the liberal media agenda, it is fit to print or show on TV. Sadly, the MSM has become nothing more than a political propaganda vehicle of the Democrat party. Hmm, which makes former President Obama’s remarks about FOX News viewers not being like those that watch the MSM even more remarkable. A new Pew Research Center analysis shows that for the first time in more than 130 years, adults ages 18 to 34 were living with their parents rather than with a spouse, partner, roomie or on their own. In 2014, about 32.1% of 18- to 34-year-olds lived with their parents and only 31.6% lived with a significant other, down about 30 points from 1960. It appears to not just be an American thing, its happening abroad as well. Want to know why we have a dithering president when it comes to ISIS? 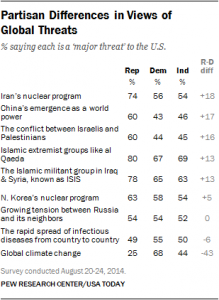 According to a recent PEW poll, Barack Obama and Democrats think that global warming is actually more of a threat than terrorist groups like Al-Qaeda or ISIS. 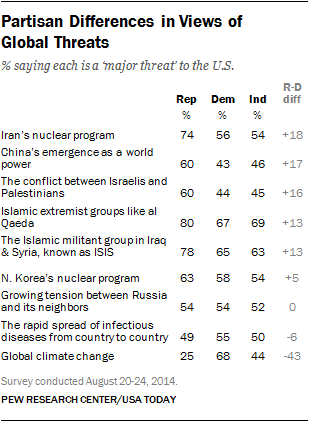 The poll shows also that climate change is also more of a concern for Democrats than nuclear programs in Iran and North Korea. 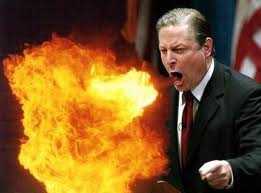 This is what America has elected president, not once, but twice and have given a majority to in the US Senate. Image if Obama was in office during the Cuban Missile Crisis? What is it going to take for a lazy, apathetic and clueless electorate to wake up, another 9-11? And you wonder why Obama has no strategy to deal with ISIS, he is too busy with his “BS” green energy give-aways that have cost the American tax payers dearly. WAKE UP AMERICA AND TAKE VOTING AND YOUR COUNTRY AS IMPORTANT AS YOU DO AS AMERICAN IDOL, DANCING WITH THE STARS AND DUCK DYNASTY!! !